Daylight Saving Time plays tricks come October. The mornings are dark long beyond when my body clock says "Morning!". My brain tells me to get up. My eyes say something different. I don't like to move clocks forward and backward. It feels like I'm trying to cheat the cosmos or mold it into some kind of seasonal convenience. It never works. October mornings are dark forever. I woke up the other morning and it was even darker than normal. "Fog!" I said to myself and sprung out of bed. I am energized by weather, especially gloominess. 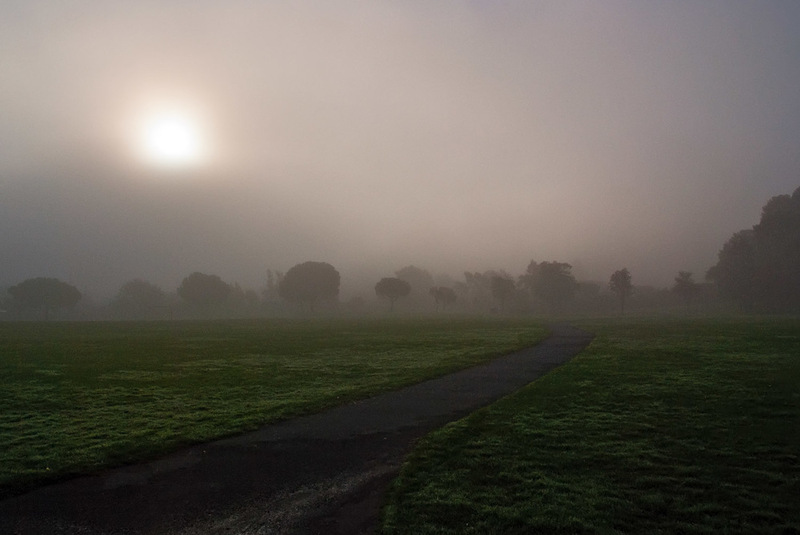 I grabbed my camera and went down to the park, knowing that the low-hanging fog would soon burn off like cotton candy on a tongue. The sun poked through the mist. I had less time than I thought. Exposure is tricky when shooting into the misty sun. I fumbled with the stupid camera controls, missing the blunt simplicity of my long-lost Nikon F—a camera that mysteriously disappeared many years ago. I spun my thumb and index finger, and click, click, click. New cameras have these crappy little spin wheels and buttons that never seem intuitive. It's a simple reciprocal relationship between aperture and shutter. But, modern cameras seem to think I need five thousand pieces of data in order to get a photo. Buttons, metadata, presets. I don't need 90% of what the camera thinks I do. If I push all the buttons will it make my photos better? I don't have that many fingers! I ignore everything and bracket the shots. "Maybe if I hang the manual around my neck…” I say to myself and the imaginary camera engineer that I complain to all the time. Suddenly I realize that it isn't about the camera at all. The light is stunning and it's disappearing right before me. I grab at the fog and try to make it last. "One more photo!" I plead to it. But the sun burns through it all and I need my sunglasses by the time I click my last click. I went back home in the low October light, hoping I got the photo. The golden sun erased the moment, but there it was again, appearing on my studio computer. The miracle of digital photography gave me instant feedback. The manual bracketing did the job and hit the sweet spot of exposure. Now, if only they would do something about those buttons and spin wheels….